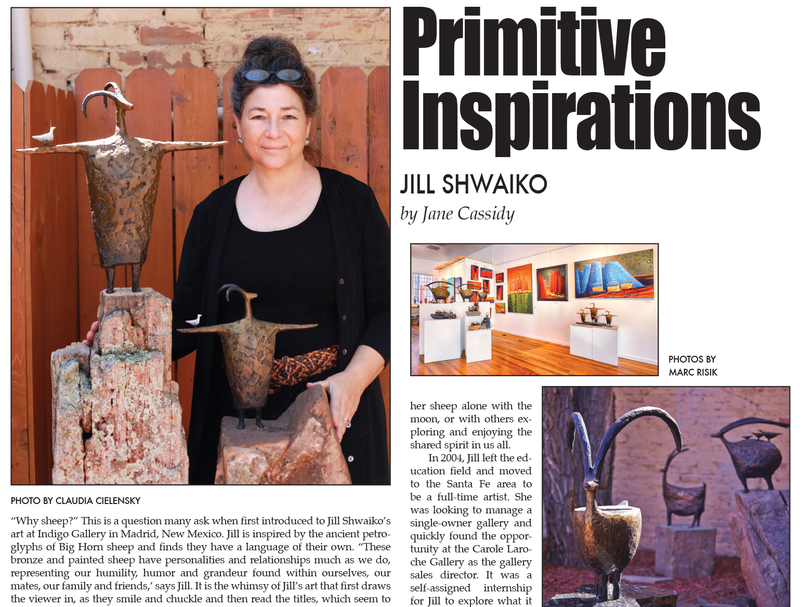 Read the story about Jill Shwaiko in the newest issue of the Madrid Artist Quarterly, Spring 2016, Vol. 3., No. 2, pgs. 26 & 27. Why Sheep? This is a question many ask when first introduced to Jill Shwaiko’s art at Indigo Gallery in Madrid, New Mexico. Jill is inspired by the ancient petroglyphs of Big Horn sheep and finds they have a language of their own. “These bronze and painted sheep have personalities and relationships much as we do, representing our humility, humor and grandeur found within ourselves, our mates, our family and friends,’ says Jill. It is the whimsy of Jill’s art that first draws the viewer in, as they smile and chuckle and then read the titles, which seem to complete the story of each piece. Her figures of sheep, whether traveling through a red canyon in an oil painting or a bronze sculpture of the sheep with arms out-stretched, just resonate with people on many levels. Her collectors come from everywhere, nationally and internationally. Jill’s complete collection can be found at her artist owned gallery, Indigo Gallery. This primitive quality of Jill’s imagery isn’t new for her. She found her inspiration early on in her career and was painting and sculpting this antiquity long before moving to the Santa Fe area. She has a Bachelor of Arts from the University of Wisconsin, her home state, and a Masters of Art from the University of Iowa. How did a Midwestern artist become inspired by the art of ancient civilizations? Jill took off a semester in college and traveled across Europe when she was 20 and discovered that unlike America, the history of these European countries went well beyond 200 years. She was especially taken by the ancient cultures of Greece and Italy and gained a deep understanding and appreciation of the art of long ago civilizations. After graduating from college and then living in California, Jill became interested in the Native American cultures and in particular their petroglyph rock art which you see reflected in her work today. After graduating from college with an MFA, Jill began her professional career in education as an art instructor for troubled teens. It helped her form a personal belief in the “development of our social, emotional & spiritual worlds as an important universal value.” This is evident today in Jill’s work when you find her sheep alone with the moon, or with others exploring and enjoying the shared spirit in us all. In 2004, Jill left the education field and moved to the Santa Fe area to be a full-time artist. She was looking to manage a single-owner gallery and quickly found the opportunity at the Carole Laroche Gallery as the gallery sales director. It was a self-assigned internship for Jill to explore what it would take to own her own gallery and also be a full time artist. Jill was also showing her bronze sculpture at the Laroche Gallery and at a new gallery in Madrid, Indigo Gallery. Finding a balance of being a prolific artist and managing a gallery was working well for Jill and she knew she could own her own gallery and continue to create her art. In 2007, an opportunity arose for her to purchase Indigo Gallery. The space had a large area in the back which Jill would soon develop into a beautiful sculpture garden. It was always a goal for Jill to own a gallery with a large area for her outdoor sculpture. The timing was perfect as Madrid was on the threshold of being discovered as a thriving art village. Jill purchased the gallery and a new chapter in her life began. Indigo Gallery will celebrate its 10-year anniversary this fall under Jill’s ownership. The gallery represents her complete collection of bronze sculpture, oil paintings and limited edition canvas prints along with the art of a dozen other southwestern artists. In the back sculpture garden area, visitors and collectors enjoy Jill’s large bronze sheep sculptures on the granite fountains by Josh Gannon and other large bronzes on New Mexico Stone pedestals. She has designed the sculpture garden space to be a very inviting and relaxed setting. Last summer, the gallery was excited to even host a collector’s wedding in the garden! Indigo Gallery always carries Jill’s newest paintings and bronze sculptures. She is currently designing a new series of sculptures for the sculpture garden. Because the bronze process is a timely one, Jill plans ahead each year for these new pieces. Currently, she is working on a new bronze series of ‘Star Gazers’, the bronze sheep looking up at the night sky. Each piece is first sculpted out of wax. Once finished, it then goes to her Santa Fe foundry and the multi-step process begins. It is the lost-wax casting method that Jill uses; an ancient process dating back to more than 5,000 years ago and still used today. It generally takes more than two months to complete the sculpture, from start to finish. Later this summer, the garden will be home to the new ‘Star Gazers’ atop tall metal columns with low level fountains at the base. Plans are already developing for next year’s bronze editions for 5 feet life sized sheep. Indigo Gallery is open daily from 10 – 5. Reprinted wtih permission from MAQ Publishers, Barb Fail & Lou French and Author, Jane Cassidy.